There are seventeen widely accepted species of pig alive today. Although some, notably the wild boar and the two kinds of warthog, are doing absolutely fine in the grand scheme of things, many are threatened to varying extents by hunting and loss of habitat. Three - the pygmy hog and the Visayan and Javan warty pigs - are formally listed as endangered species by the IUCN, and many of the others are just outside that category. On the bright side, no clearly identified species of pig has actually slipped over the line into extinction in the last few thousand years. But, of course, if you go back a few million years, it's a rather different story. Indeed, in some respects, the pig family as it exists today is a shadow of its former self. Pigs have always been reasonably successful animals (at least, without human interference), given their adaptability, moderate intelligence, and willingness to eat just about anything. But, in the past, they were more varied than today. In total, there are five generally recognised subfamilies within the overarching pig family - and all but one of them are known only from fossils. Pigs first appeared in Asia around the end of the Oligocene or beginning of the Miocene, around 23 million years ago. Over the next few million years, they seem to have diversified rapidly, with all five subfamilies likely coming into existence by 20 million years ago, if not sooner. They seem to have lived alongside one another - albeit not always in the exact same part of the world - for most of the time since. The living subfamily, the suine pigs, is no exception to this, with pigs very similar to the modern sort having existed since at least the Late Miocene. These kinds of pig are distinguished by a flange of bone at the side along the side of the skull that separates the jaw muscles from the snout muscles, allowing the latter considerable flexibility - something that's useful for snuffling about in leaf litter with a flattened nose disc. So these pigs, at least, we can be confident looked very 'pig-like'. Indeed some are so similar to modern forms that they can be placed within existing genera. Sus strozzi, for instance, entered Europe shortly before the first Ice Age, at roughly the same time that wolves did. It seems to have been marsh-dwelling, and therefore may have resembled modern warty pigs more than the wild boar that eventually replaced it. Others are at least identifiable as belonging to particular branches of the modern pig family tree. Kolpochoerus, which lived alongside early humans in Africa, seems to be an early bushpig, feeding mainly on grass, but possibly with a greater preference for damp forests than its modern kin. Metridochoerus was a giant warthog, with fully grown males estimated to have weighed around 380 kg (840 lbs), well over double the size of the living species, and with four long tusks flaring out of the sides of their mouths. Like modern warthogs, they were grazers, feeding mainly on grass, but were likely better able to move into the dry savannah than the contemporary Kolpochoerus. 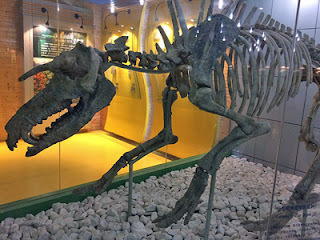 A particularly common early example was Microstonyx, which is known mostly from Late Miocene Europe, especially the Balkans, but has been found as to the east as China. Probably related to wild boar and warty pigs, it had relatively small tusks (although still larger in the males) and lived in both dry, open country, and in seasonal monsoon forests, suggesting that it must have been quite adaptable. Among the four extinct subfamilies, the tetraconodont pigs seem to be the most closely related to the living sort, and were probably the last to die out, not long before the Ice Ages began. First appearing in Asia, they soon spread to Africa as well, and were very common there towards the end of the Pliocene, 2.5 million years ago. They are distinguished largely by some unusual forms to their teeth, especially the premolars, but the exact nature of these changes varies considerably between different species. Tetraconodon itself, and its closest relatives, had exceptionally large premolars, which they likely used to crush hard and crunchy foods such as large nuts, or even bones. These pigs first appeared in or around Myanmar, but are known to have reached as far west as Pakistan. At around the same time, however, other tetraconodontines crossed to Africa, and evolved into Nyanzachoerus, another unusually large pig. Although its tusks were not particularly large by the standards of pigs, Nyanzachoerus did have an unusual series of flanges and bumps along the side and upper surface of the snout, giving it an appearance more dramatic than a modern warthog. It lived widely across northern Africa and Arabia, reaching at least as far south as Kenya, and probably had a diverse diet. Quite what all the bumps on the face were for isn't evident, but it's possible that they were a sexual signal of some kind. Living alongside Nyanzachoerus, and probably derived from it, Notochoerus was even larger, and also had four large tusks that stuck out forwards and sideways. Particularly common in Ethiopia and Uganda, and living well into the Pliocene, these giant pigs may have weighed around 450 kg (990 lbs). Perhaps the most unusual of the subfamilies, however, was that of the listriodont pigs. These were distinguished by sharp ridges on their teeth that look suited to cutting up leaves, as well as large, clipping, incisor teeth. This would suggest that, unlike other pigs, they were herbivorous, rather than omnivorous. They are known from Europe, Asia, and Africa, rapidly spreading across the Old World after their first known appearance, and they became more specialised as time passed, before dying out early in the Late Miocene, around 10 million years ago. Listriodon itself is the most widespread member of the group, and was about the size of the largest pigs alive today, the giant forest hogs of Africa. Eurolistriodon is about the same age, but found only in Europe and, apart from being slightly smaller, was distinguished by sharp bony protrusions above its upper tusks. The most remarkable listriodont pig, however, was Kubanochoerus, another Eurasian form of the Early to mid Miocene, with the last known example living around China. Sometimes regarded as odd enough to warrant its own subfamily, it is more usually considered an offshoot of the listriodont lineage, and may well be the largest pig ever to have lived. Not only was it likely heavier than the closet known contender, Notochoerus, with an estimated weight of 500 kg (1,100 lbs, or half a ton), but it was also considerably taller, its long legs giving it a shoulder height of around 120 cm (four feet). But that wasn't what was so odd about it. No, the really strange thing about Kubanochoerus was that, in addition to sharp bumps above each eye, found in both sexes, males had a single, long, blunt, horn sticking of the middle of their foreheads, inviting an obvious comparison with unicorns. Presumably, these were used in fights for access to females, in much the same way as the more typical horns of other cloven-hoofed animals. We know relatively little about the fourth subfamily, the cainochoerine pigs. Originally thought to be miniature listriodontines, evidence now supports a less close relationship, without really revealing much more about how they lived. They did, however, survive much longer than the true listriodontines, dying out at the dawn of the Pliocene, not long before the tetraconodonts did. Exactly where to draw the line between the pig family and its closest living relatives is slightly controversial. However, the oldest fossils that are universally agreed to be pigs are the hyotheres of the very Early Miocene. These were the most primitive, and least specialised, of the pigs, and, by some definitions, were also the first to die out, around 12 million years ago, in the Middle Miocene. Even they, however, already had the distinctive tusks that allow us to distinguish pigs from peccaries, and the earliest example, Hyotherium, is known to have reached as far as Japan (which, admittedly, not yet fully separated from the mainland). I say "by some definitions" because the position of the east Asian animal Chleuastochoerus, which survived into the Pliocene, is slightly ambiguous. It certainly resembles the hyotheres, but, if that's what it is, it's a side-branch to the main subfamily, with unusually strong jaw muscles (although still suited to a softer diet than modern pigs) and decent rooting ability. Other studies have argued that it was closer to the tetraconodonts, and that the hyotheres may not really be as ancient a group as they appear, implying the existence of a number of early listriodont species that didn't leave fossils. Which is plausible, given how varied they appear to have already become by the time of their oldest known remains. The overall picture then, is that pigs first appeared around 23 million years or so ago, and then rapidly diversified into the listriodonts, caenochoerines, hyotheres, and more modern pigs. In the Early to Mid Miocene, around 16 million years ago, the tetraconodonts split off from the suine pigs, with the babirusas splitting off again about 5 million years after that, followed not long after by the break between the warthog-like and wild boar-like pigs. Wild boar diverged from the warty and bearded pigs during the Pliocene, leaving the fine-tuning between modern species to occur as some populations were split off from others during the Ice Ages. But, during all of that time, for all their ability to repeatedly move between Eurasia and Africa, there is one thing the pigs never did: enter the Americas. Over on that side of the Pacific, the peccaries took their niche, and they too have a long fossil history, which I will look at next time, in what should be the last post in this series. One minor remark (a pet peeve of mine): Kolpochoerus is not an early bushpig (Potamochoerus)! It is in fact much more closely related to the extant giant forest hog (Hylochoerus), and to a lesser degree, to the extant warthogs (Phacochoerus).